Successful residential and commercial lighting design takes advantages of the many features of LED stair lights. This modern lighting is energy efficient, long lasting and able to run on low voltage. It is also durable and can withstand extreme temperatures. Lighting with LED (light emitting diodes) fixtures or strips is an ideal solution for stairways, both indoors or outside. Although the primary purpose of lighting is optimum visibility for whatever activities are taking place, safety and attractiveness are also important considerations. A stairway is usually well lit to increase safety, show the way and offer an invitation to move from one level to the next. The flexibility of LED lighting allows a designer to combine functionality with creativity. 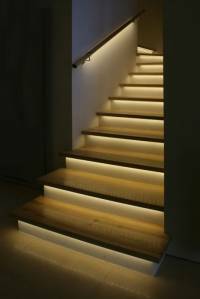 Although safety is important, most homeowners do not want their stairways to be so well lit they become a distraction. Fortunately, LED lighting can be activated by a simple motion sensor. LED lighting is also practical outdoors in a home setting. Light bulbs at each step can welcome visitors to the front door. Strip lighting can outline the steps on a backyard deck, making sure no one takes a fall at an evening backyard barbecue. Whether for a single home, apartment building or large commercial complex, LED stair lights are available as light bulbs or strip lighting. They come in various colors and can be motion activated. The flexibility of this LED lighting allows designers to address safety issues while creating interesting, engaging environment.